Phagmodrupa Dorje Gyalpo (Tib. ཕག་མོ་གྲུ་པ་རྡོ་རྗེ་རྒྱལ་པོ་, Wyl. phag mo gru pa rdo rje rgyal po) (1110-1170) — one the three foremost disciples of Gampopa, and an historical master of the Kagyü tradition. Before meeting with Gampopa, he also studied with Sachen Kunga Nyingpo—with whom he stayed with for twelve years, receiving the Lamdré teachings, Padampa Sangye and Chapa Chökyi Sengé. 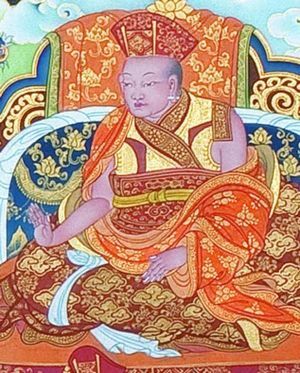 After Gampopa's death, Phagmodrupa left Central Tibet and settled in Phagmo Dru, Kham, and founded the Pagdru Kagyü school which later splintered into eight sub-schools, each one respectively being founded by one of his eight main students (see Kagyü). He was also the elder brother of Katok Dampa Deshek, the founder of Kathok Monastery. This page was last edited on 13 February 2019, at 07:26.